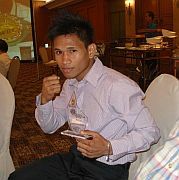 Promising Johnriel Casimero will battle Moruti Mthalane for the IBF champion’s flyweight title in a championship double-header titled “African Glory 2” in Johannesburg, South Africa on March 26. In the co-main event of well-known promoter Branco Milenkovic, IBF junior featherweight champion Steve Molitor (33-1, 12 KO’s) will defend his title against Takalani “The Panther” Ndlovu (31-6, 18 KO’s). Filipino promoter Sammy Gello-ani informed the Inquirer that he had decided to move Casimero from light flyweight where he was ranked No. 6 by the World Boxing Organization to flyweight for the title shot at Mthalane. Mthalane who is 28 years old has a record of 26-2 with 17 knockouts. IBF executive Lindsey Tucker said the fight was “an optional defense” by Mthalane. One of the little South African’s losses was against then IBF/IBO flyweight champion Nonito “The Filipino Flash” Donaire who won by a 6th round TKO on November 1, 2008 after blooding his nose and opening up a nasty cut on his eye. Mthalane won the IBF title with a unanimous twelve round decision over Julio Cesar “Pingo” Miranda on November 20, 2009. Miranda later went on to win the WBO title with a 5th round TKO over Richie Mepranum on June 12, 2010 . In his last defense Mthalane scored a 5th round TKO over Zolani Tete on September 1, 2010. The 21 year old Casimero who has a record of 14-1 with 8 knockouts dropped a split decision in a WBO light flyweight interim title fight to Ramon Garcia Hirales in Sinaloa, Mexico on July 24, 2010. Prior to that Casimero scored a sensational 11th round TKO over heavily favored Cesar Canchilla, dropping him once in rounds 3, 6, 9 and twice in round 11 in a WBO interim title fight on December 19, 2009.